« Can You Live Your Whole Life For God? YES! Great Is Thy Faithfulness, or Is Today Enough For You? While a student at Harding in the late 60s, Owen Olbricht, director of Campaigns Northeast, introduced me to the hymn Great Is Thy Faithfulness. We sang it often in devotionals, sometimes in parks, and even once on a local TV station. Yesterday, after receiving some especially good news, Sherrylee started quietly singing this great hymn again—and I joined in. Her voice is much lower than mine, so when she starts a song, her natural pitch leaves me no choice but to sing the tenor to it. Regardless, however, of who sings which part, that particularly hymn has been a special blessing to us at significant moments in our journey for many, many years now. 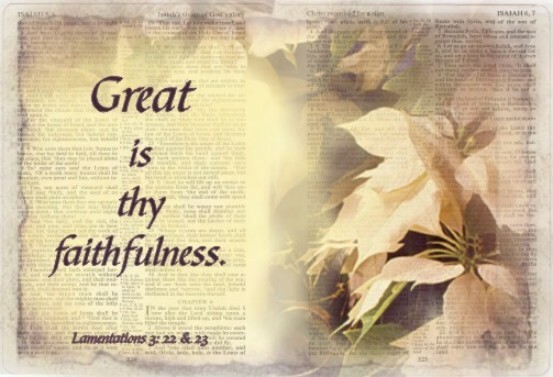 Great is thy faithfulness, Oh God, my Father. . . . Thou changest not. . . .where thou hast been, thou forever wilt be! If you know our story, you know that Sherrylee and I feel like our mission time in Germany were some of the best and most formative years of our lives, but that made it all the harder when overnight literally we found ourselves on a plane back to the U.S.. We felt like we had been ripped out of home, dreams, church, mission—all those things that give purpose to life. How could things change so quickly, so drastically! This song reminded us then that God had not changed. He was still in control. He knew where we lived. He knew our pain. He had not abandoned us—nor we Him, so in spite of a traumatic upheaval in our lives, God had not changed and was not far from us. Summer and winter and springtime and harvest . . . join with all nature in manifold witness to thy great faithfulness, mercy, and love. Life has seasons. Our time in Germany was a wonderful time, but so were our twenty-two years in Oklahoma. We had serious doubts about whether Oklahoma was really where we should be! After all, we were missionaries, not Sooners! But God was faithful and took that season in Oklahoma and shaped that moment into a wonderful place to raise our family, a meaningful ministry with students at Oklahoma Christian, and a place and time for Let’s Start Talking to take root and grow. And now in the fall and winter season of our life, the mercy and love of God is even more evident. We continue to love deeply the work we have been given; we are surrounded by not only a God-called team of co-workers, but grown, faithful children– and grandkids who are being taught God’s faithfulness every day. What more could anyone ask for. God is faithful, full of mercy and love. Morning by morning new mercies I see! Strength for today . . . The more I learn as I walk along the journey with God, the less I worry about tomorrow—not because there is less uncertainty, not because there is less catastrophe around the corner, but just because I think I’ve learned that God only takes care of us one day at a time! It has something to do with the same reason he gave the Israelites only one day’s worth of manna every day (except on the Sabbath). It’s Jesus in the garden praying in spiritual pain for what was going to happen the next day. It’s Noah not knowing if and when the dove would return! As Executive Director of LST, I’m often asked about our five-year plan: where do you want LST to be in five years? Or we sit and talk about how wonderful it would be if the ministry were supported with an endowment, so that we did not live each year hand to mouth like we have for the last thirty-one years! My personal fear is that sometimes we are trying to build barns and create our own security rather than depending on the Lord day by day. Fortunately, the Lord has never given us that kind of security, not personally nor in the ministry—and I keep thinking that maybe day by day, morning by morning, maybe that is supposed to be enough! Great Is Thy Faithfulness, O God, My Father! I celebrate that you received good news today! Thank you for sharing. Just change the names, dates and places…and your story matches ours. Great Is Thy Faithfulness, O God, My Father! One of our favorite songs by Thomas Chisholm.. These words carried me through some very dark moments in my life, and continue to fill me when days are challenging. Morning by morning new mercies I do see. It is enough. I am alive, in Romania, because of God’s mercy. People are waiting for the next LST Team to arrive. That is more than enough!